Happy Monday Everyone! I hope you’ve had a wonderful and relaxing weekend! This past week has been one of growth and transition for me. My husband and I are finally really getting settled in our new place, making it our own. Embracing all the new opportunities. My Monday was quite the eventful one. It was so good! Most of the day was spent shooting (photography). I did still have time to make a quick lunch though. 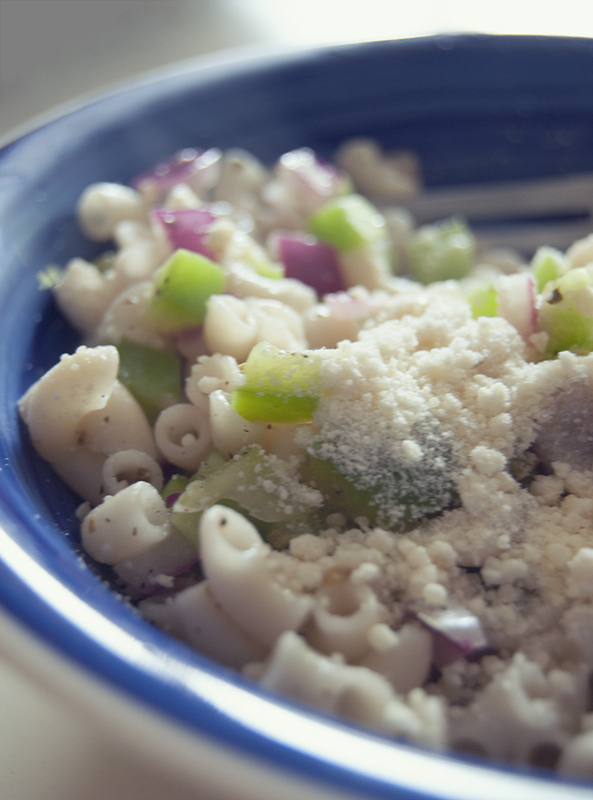 Warm pasta salad. Yum! I know what you’re thinking… That doesn’t sound too good. Trust me on this, it’s better than it sounds. This would be a great side at a late summer/early fall BBQ or cookout. In other exciting news, Monday was also the day a magazine contacted me asking for permission to use one of my photos! I was so excited! Enough about me, here’s the recipe! What exciting things have happened for you this week? I’d love to hear about it in the comments! Have a wonderful week! Cook and drain your pasta. Meanwhile, heat red onion and green peppers with olive oil in frying pan until warm and slightly soft. Mix onions and peppers in with pasta. Add apple cider vinegar and heat on low. Add in more vinegar as needed to coat pasta. Mix in spices as desired. Previous PostHow I Failed FridayNext PostHello Thursday! …And Gluten-Free Pumpkin Muffins.